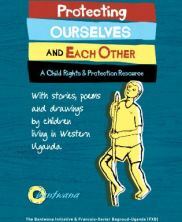 This booklet was developed in Western Uganda to raise awareness among children and caregivers about child protection and child rights issues. The guide contains information that helps children and their friends understand their rights and responsibilities and find ways to identify resources in their communities that can help when rights are being violated. The booklet is also useful for teachers, caregivers, and other organizations working to strengthen community child protection services. The booklet is organized into five sections and contains information, stories, poems, and drawings around the seven most commonly identified child rights abuses and violations, including: child labor, child neglect, defilement, domestic violence, drug and alcohol use, early marriage, and denying education. The booklet was developed by the Bantwana Initiative and Francois-Xavier Bagnoud-Uganda in conjunction with community-based organizations, youth-led child rights clubs, and district officials in the districts of Kasese, Kabarole, and Kyenjojo in Western Uganda.